The marriage of old and new can be a difficult process, particularly when the existing structure has intrinsic heritage value. 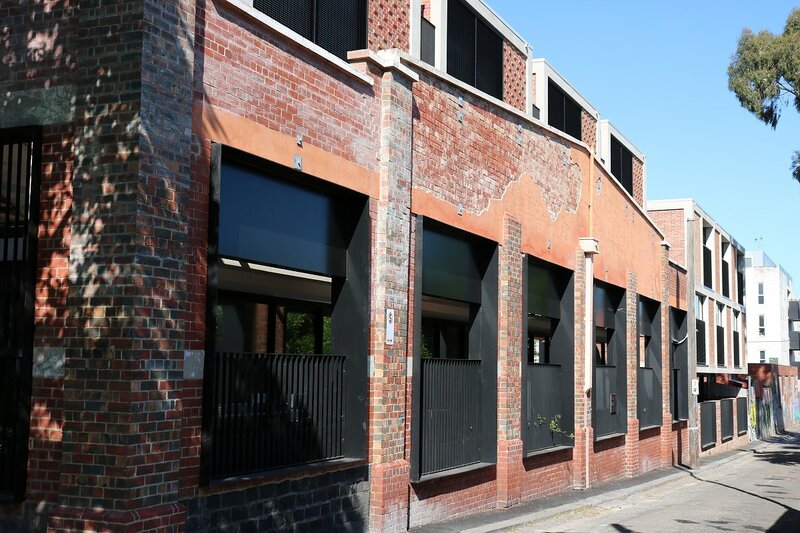 In previous times Fitzroy's 237 Napier Street served as the home of furniture manufacturer C.F. Rojo and Sons. Taking root during 1887, Christobel Rojo oversaw operations though over time the site would become home to furniture manufacturer Thonet. 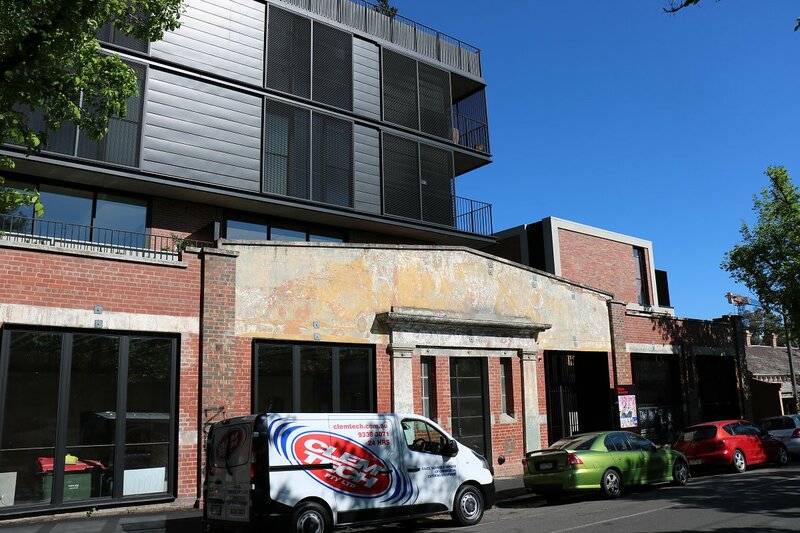 As with many significant buildings around Fitzroy, 237 Napier Street would see a new purpose as housing stock with DealCorp going about redeveloping the existing building into C.F. Row...and an impressive outcome it is! C.F. Row is the quintessential inner suburban red brick exterior facade melded with new dark-toned additions that provide contrast, albeit on a visually pleasing level. Designed by Woods Bagot, C.F. Row includes 45 apartments and 7 townhouses split between 1, 2, 3 and 5 bedroom dwellings. Two basement levels and five contemporary levels of living sit behind the historic facade. Works began on the project at the beginning of 2016, with all bar a ground floor tenancy fit-out completed. Apartments choices consist of 18 one-bedroom, 22 two-bedroom, four three-bedroom and one five-bedroom dwelling whilst all the townhouses include three-bedrooms. Internally the townhouses span between 143sqm and 167sqm. C.F. Row's apartments are set to the south of the site, directly behind the C.F. Rojo and Sons facade, with an indented level above the historic structure providing a break between old and new form. Conversely, the SoHo townhouses sit in behind the 'restored' northern facade, with a contemporary addition also adjacent. Both buildings are separated by an east-west passage which also provides additional light penetration and a secondary perspective aside from those facing directly away from the site. C.F. Row is an effective marriage between old and new, and in many ways mirrors the Jaques Richmond Stage 1 redevelopment in colour palette, size and composition. 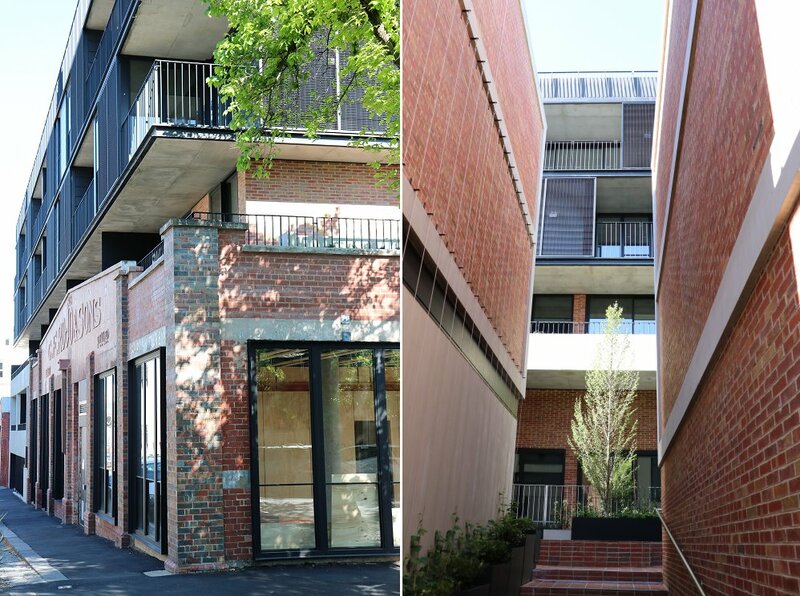 The earthiness and relatability of low-rise red brick facades cannot be underestimated and is perhaps a reason why they are so popular in contemporary designs in areas such as Richmond, Collingwood and Fitzroy. Historic elements to three sides, scale, location, history and a complementary material palette; C.F. Row simply wins on numerous levels. In my opinion, it is certainly one of, if not Melbourne's most visually satisfying new addition of 2017. I'm a fan of this one. In the flesh, it really looks like a quality build, and the palette and styles mean that the old and the new are pretty complimentary. Once again I feel lucky that my 'burb is one where architects and developers usually seem to understand and respect what their buildings are part of. Only a matter of time before it's labelled as facadism by the usual mouthbreathers. I actually really like this. Who knew? Quality outcomes will always be praised. Well, now that the congratulations are out of the way, let's have a closer look. The St. David Street frontage has a huge expanse of open area with a carpark entrance, services, etc. behind steel bars with a view of the concrete base structure. There are many ways this could have been addressed, but the "quality" of this street frontage is very industrial indeed. And while we're on the issue of a "quality build" - have a close look at the paving in the "laneway" constructed behind the opening gates on Napier Street: it's literally all over the place and up and down with water ponding when it rains. I'm not talking about a small variation, either - the substrate appears to vary up and down by 40-80mm in a series of hills over a 3-5m distance. Also, the planters obstruct the pathway when pedestrians are moving in opposite directions. Let's hope none of the residents have a disability / mobility issues. From a design perspective, the "townhouses" to the northern elevation are built with their first floor projecting weirdly below the existing facade window openings, with some sort of aluminium sheeting used to cover up the discrepancy. While the building is better in build quality than many in the inner city, that bar is already so low that it's hardly worth mentioning. And yes, it engages in fairly extreme facadism, and despite the fact that the historic building had no heritage protection (and still doesn't) this is a hardly a well thought out response to site and neighbourhood. And finally, almost all of the original steel frame windows have been demolished and replaced with contemporary versions, losing a key feature of the historic shell. In design terms alone, C.F. Row gets a fail from me. I'm not sure what the deal is with the townhouse levels. I presume there was some sort of compromise required and the outcome is less than ideal. I didn't pay enough attention to the paving. Yeah, it's facadism. But I'm not so down on that when it, at least, shows some respect to the facade being ism'd. Which I think this does. Of course something valuable is lost in the process, but also something is gained and something is preserved and I'm easier with that compromise than you are. I'm not sure why you don't think it's a fit for the neighbourhood. I think it sits pretty well. I just don't think it's a great design - it's heavy in massing to the south elevation, with poor / zero setbacks to the facade, and the black painted finishes make it look more top heavy than it actually is. I much prefer Millieu's efforts in concrete just a few paces to the south along Napier Street - there's a lightness of touch in the way the building sits in the streetscape and in response to Whitlam Reserve and the Town Hall not in evidence with C.F. Row. It could be worse, but it could definitely have been a lot better, too.